On 21st March 2018 I sucessfully defended my PhD Thesis entitled: “New Applications of Covariance NMR and Experimental Development for Measurements of Homonuclear Coupling Constants in Overlapping Signals” (ISBN: 9788449079252), supervised by Dr. Teodor Parella and Dr. Pau Nolis, and obtained the degree of Ph.D. in Chemistry at the Department of Chemistry, Universitat Autònoma de Barcelona. The thesis can be downloaded in PDF format from the TDX repository and from the TESEO repository. Accurate measurement of proton homonuclear coupling constants in overlapped signals by using a doubly-selective TOCSY G-SERF experiment. 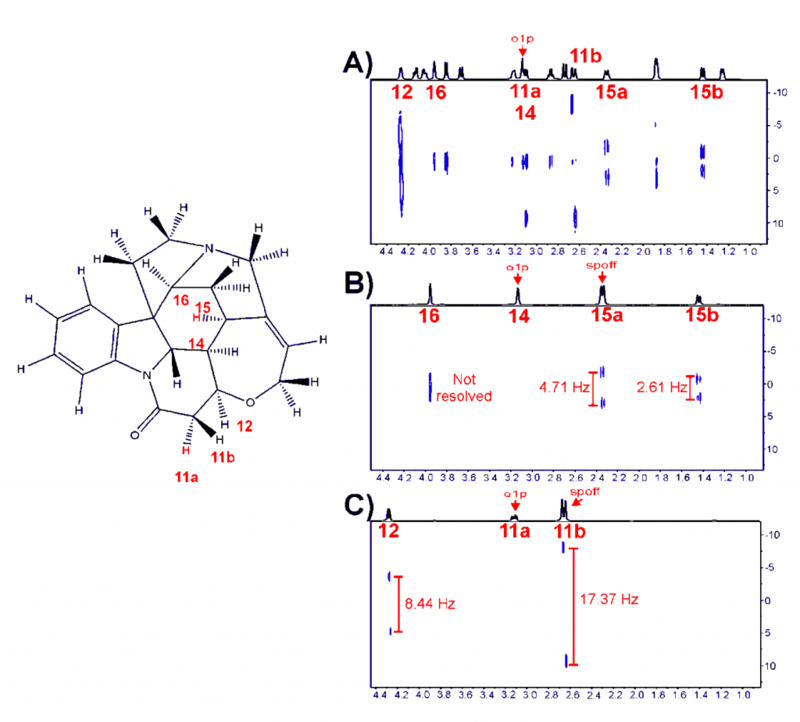 The experimental results obtained in this thesis are presented in the form of three papers published in NMR specialised scientific peer-reviewed journals. 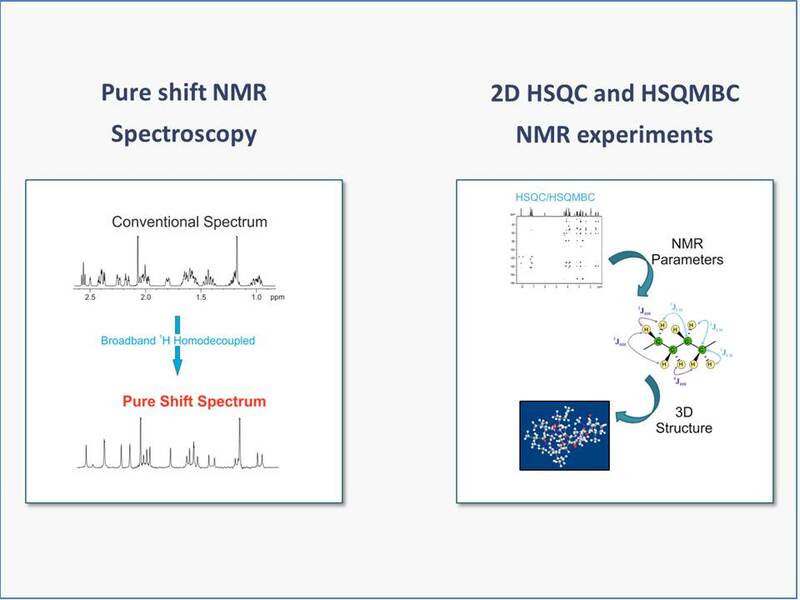 The first two articles deal with the use of covariance NMR as a general method to generate novel psNMR spectra. The last work describes a new selTOCSY G-SERF experiment, for accurately measuring JHH in overlapped regions. The first publication describes a novel general protocol to generate psNMR spectra by Covariance NMR. This new approach is unique in NMR spectroscopy; giving a cheap, fast an easy way to reconstruct psNMR spectra without spending time in the spectrometer. This new strategy has been referenced to as psNMR Covariance. The concept of psNMR Covariance has been extended in the second publication by inserting Multiplicity-Edited (ME) information into 2D experiments that are difficult or even impossible to achieve experimentally. It is shown how the ME information can be efficiently transferred to a set of homonuclear and heteronuclear 2D NMR spectra by Covariance processing, reconstructing new psME spectra in a fast way. Finally, G-SERF and related methods only work for isolated 1H signals on which selective excitation can be successfully applied. Unfortunately, as it happens in other frequency-selective experiments, this approach fails for overlapped signals. A doubly-selective TOCSY G-SERF scheme is presented in the third publication to circumvent this limitation, by measuring JHH efficiently even for protons resonating in crowded regions. Abstract: Covariance processing is a versatile processing tool to generate synthetic NMR spectral representations without the need to acquire time-consuming experimental datasets. Here we show that even experimentally prohibited NMR spectra can be reconstructed by introducing key features of a reference 1D CHn-edited spectrum into standard 2D spectra. This general procedure is illustrated with the calculation of experimentally infeasible multiplicity-edited pure-shift NMR spectra of some very popular homonuclear (ME-psCOSY and ME-psTOCSY) and heteronuclear (ME-psHSQC-TOCSY and ME-psHMBC) experiments. André Fredi made an oral presentation at the 8th GERMN / 5th Iberian NMR Meeting (GERMN 2016) held in Valencia, Spain from 27th to 29th June 2016. In his presentation, that was titled “Exploring the use of Generalized Indirect Covariance to reconstruct Pure Shift NMR spectra: Current Pros and Cons”, André explained how to make pure spectra shift from Generalized Indirect Covariance processing (psGIC). This new method is basically a new way to get “synthetic” pure shift spectra without the need to purchase a pure shift spectrum in the spectrometer and without the penalties that pure-shift experiments cause. André has been working as a Ph.D. candidate at the Department of Chemistry and SeRMN under the direction of Dr. Teodor Parella and Dr. Pau Nolis since November 2014, when he enrolled in the Department of Chemistry doctoral program at Universitat Autònoma de Barcelona with a fellowship from CNPq-Brazil. He is currently in his second year and expects to defend the doctoral thesis on 2017/2018. Exploring the use of Generalized Indirect Covariance to Reconstruct Pure shift NMR Spectra: Current Pros and Cons. Title: Exploring the use of Generalized Indirect Covariance to Reconstruct Pure shift NMR Spectra: Current Pros and Cons. Authors: André Fredi, Pau Nolis, Carlos Cobas, Gary E. Martin and Teodor Parella. Last 16st July 2015 I defended my PhD Thesis entitled: Development and application of modern pure shift NMR techniques and improved HSQC/HSQMBC experiments.